National FFA Week spent with future FFA members! Untied shoe laces, stuffy noses, wondering eyes, and a willingness to learn! One of my days during National FFA Week was spent with future FFA members. Wednesday at Prairie Heights High School, I spent the day with Kindergartners, First, Second, and Third Graders. Besides tying shoelaces and a small misfortune of throw-up, my morning was spent talking to the students about FFA. Along with two members we explained the different levels within the FFA, which include: Chapters, Districts, Sections, State, and National. We showed them the memorable blue jacket and a scrapbook of many FFA activities and events. After lunch I traveled to every rotation taking pictures and listening to the high school members teach about the farm animals on the school farm, the aquaponics lab in the greenhouse, ag. safety in the shop, the importance of GPS systems, and sharing with them the use of farm equipment. The kids were always excited to learn about the steer and calf, they discovered how much quicker they grow than humans and what they are fed each day. Ag. safety was put into action when the kids had to wear safety equipment while learning about the equipment used within the shop. Recently the P.H. Chapter constructed an aquaponics lab. Members explained to the elementary students the process of raising fish and using their waste to fertilize and grow plants. When the students traveled to the greenhouse they practiced hose to use handheld compasses and read direction on a map. After mastering this skill they tacked understanding how GPS technology is used within agriculture. And the favorite of many was the tractor safety rotation. The parking lot was filled with tractors of all shapes, sizes, and colors. Each student got to see the equipment up close and personal by sitting inside and viewing the controls and technology within the cab. Even though I have helped with Elementary Ag. Day the past four years at my home chapter, each year it amazes me how much the elementary students enjoy and learn from a short ten minutes at each station. And Wednesday I was reminded the joy of watching the kids take in this "small" hands on experience. Some have never seen a farm animal close, or even been around farm equipment. I'm glad we have had the opportunity to share agriculture and FFA with them each year during National FFA Week! Over 523,000 FFA members are celebrating National FFA week this week! My teammates and I have spread out all across the state of Indiana visiting dozens of FFA chapters as we celebrate National FFA week. Monday, my teammate, Morgan Gadd and I had the opportunity to travel with the North Miami FFA Chapter as they went on their annual ski trip. Each year, FFA members from North Miami FFA Chapter have the opportunity to go on a ski trip if they have achieved a certain number of points based on the chapter's participation points system. By 6:30a.m. Monday morning, we had loaded up the school bus, departed from North Miami High School, and were heading north to Bittersweet Slops in southern Michigan. Despite the early hour, the FFA members carried a high level of enthusiasm and maintained that energy all day long while skiing on the slopes until we returned home at 10:30p.m. The ski trip was an amazing and unique way to celebrate our very own National FFA week. 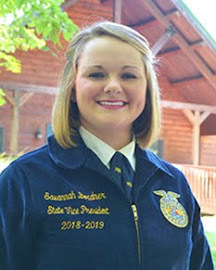 All across the country this week, FFA members will be celebrating the fact that we are the future business owners, scientists, government officials, engineers, and farmers of our great nation. This year, the National FFA theme, as well as the Indiana FFA theme is "Infinite Potential" meaning each and every FFA member has what it takes to accomplish anything we want to do. The future belongs to the FFA members, just as it has since 1928...and it always will! Our State Officer Team started off National FFA Week at the Indiana Young Farmer Convention, which was held this past weekend at the Hilton in Indianapolis! Young Farmers from across the Hoosier State gathered together to celebrate their 49th year and all of their accomplishments. National Young Farmer Association President, C.J. 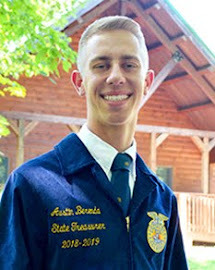 Fleenor, past Indiana Young Farmer Assocaiton President, rejoined his fellow Hoosiers to thank them and promote their future involvement on the national level. Our team participated in workshops throughout Saturday. Mr. Brandon Seitz presented information about the evolving energy industry as it strives to meet and influence renewable portfolio standards. We learned about challenges presented by proper or improper landscaping with Mrs. Melody Warner. We also spent time with Mr. Chuck Tietmann as he shared his energizing convictions and touching stories about safety in the electrical industry. We hosted "The It's Not Too Late Show" with host Micah Matlock to celebrate not the candles on the IYFA's birthday cake, but the challenges they have met "Head On", the achievements under their belt, and all the ambitions they are chasing. Meanwhile, four members of the Hamilton Southeastern FFA Chapter provided childcare and other activities for the pint size IYFA members, and we all concluded the evening with more than a few hours of dancing. Thank you, Young Farmers, for all you have done and continue to do. We look forward to working together to ensure a productive future in Agriculture! Micah and I traveled to the Adams Central FFA Chapter's Annual Petting Zoo in Monroe, Indiana. For 13 years the Adams Central FFA Chapter has put in a petting zoo for the elementary students and community members for a full 2 days. On Thursday elementary students visit the petting zoo to learn about the animals and agriculture during the day. At night, the community is able to visit the petting zoo. Stations at the petting zoo include learning about meats, bees and honey,ag safety, animals, fruits and vegetables, grains, spices, and dairy products. Students also get to sample the products and even get some free popcorn. Mr. Jones, the advisor at Adams Central said, "More than 850 kids come through the petting zoo and walk away with a general knowledge of products from animals, how we care for animals, and how important agriculture is." Macy Mudd, a junior at Adams Central and Chapter President said, "It's a great opportunity for the kids and a great opportunity for our members to interact with the younger kids." Micah and I had a blast! The Adams Central FFA chapter truly shows their passion for agriculture and education the public. 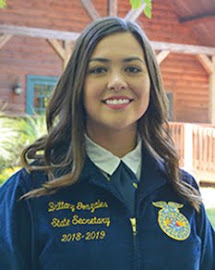 which was facilitated by Micah Matlock (State FFA Sentinel), Morgan Gadd (State FFA Northern Region Vice-President), and Nellie Bell (State FFA Southern Region Vice-President). That night, the students learned about character, opportunities in FFA, creating a clear vision, and developing better time management skills. The evening was filled with fun, excitement, and interactive learning. 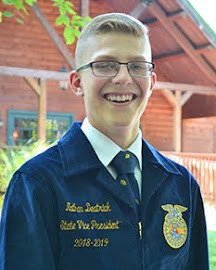 Through the interactive session, the students were made aware of the many CDE’s (Career Development Events) that are available to them through FFA. The State Officers served as a resource and answered any questions the students had about getting involved in the CDE contests. 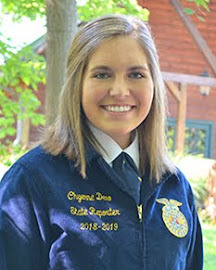 Making the connection between the logistics of competing in contests and the professional skills gained, was key in motivating students to become more involved in FFA activities. 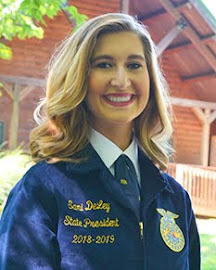 Along with making students aware of their opportunities in FFA, the State Officers helped to provide some tools for better goal setting and prioritizing in their daily lives. Since the students from Clinton Central could not make it to the annual S.O.A.R. conference in the fall of last year, Mr. Rodger Carr (Clinton Central FFA Advisor) decided to bring S.O.A.R. to the students. 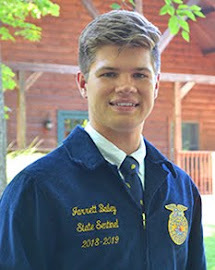 Mr. Carr invited the State FFA Officers to visit Clinton Central FFA where the “Mini-conference” was hosted in hopes to inspire students to attend the many leadership conferences hosted by the Indiana FFA. Offering this “Mini-conference” allowed students to engage in conference like activities meant to motivate and promote premier leadership, personal growth, and career success. Only in FFA, Donkey Basketball! Everyone looks forward to the weekends! Well in the Indiana FFA this past weekend was a very memorable one full of fun. This past Saturday January 29 hundreds of 4-H and FFA members from throughout the state journeyed once again to Purdue University for the State Meats and Dairy Evaluation CDE’s! After hours of judging cuts of meat and taking written tests about meat and dairy products, results were given out and the hard work had been paid off! Upon completion of the state CDE’s, our state officer team headed toward Fishers, Indiana to Fishers High School to witness an awesome game of donkey basketball put on by the Hamilton Southeastern FFA Chapter. We witnessed men and woman of all ages TRYING to stay on their donkey while TRYING to shoot a basketball into the hoop. There were most definitely no Michael Jordan’s on the court, but there may have been a few John Wayne’s! Everyone in the crowd had a great time watching the game but the sight on the court wasn’t the most enjoyable part of the evening. 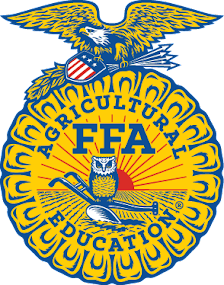 The Hamilton Southeastern FFA Chapter had a goal for the evening and that goal was to raise money for a scholarship fund titled the Carrie C. Colgazier Scholarship. This scholarship is in memory of a former student who had been killed in a drunk driving incident. The scholarship is worth 12,000 dollars. Seven scholarships have already been awarded to deserving students, three of which were FFA members. Only in FFA can you find young leaders bringing their community together to have fun and create financial support for students going to school with means of a donkey and a basketball!